If you only need to access blocked sites, please try My IP Hide. Here is the comparison between My IP Hide and Elite Proxy Switcher. Earn money when a visitor comes from your website buys our product or service. You can get 30% commission on sales. Start to earn now! 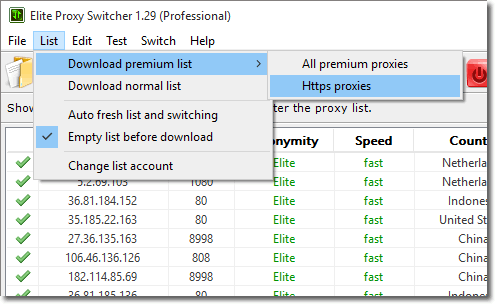 After buy our proxy, you can use either Elite Proxy Switcher free edition or professional edition to download the proxy list. Our proxy list is updated every hour while the premium list is updated every minute. 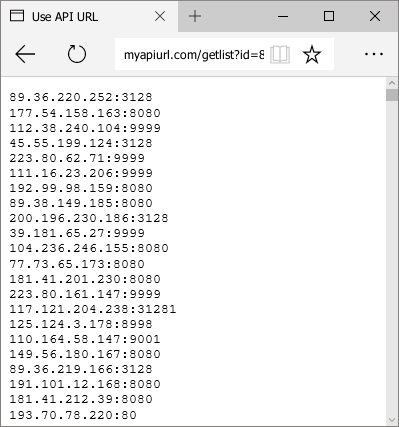 You can also use the API URL to get the proxy lists. * Premium proxy list contains only anonymous proxies and is updated every 5 minutes. It ensures its 90% proxies are working. It is best for the users who want to get working proxies quickly without testing a big list. Jump to here to know more about our premium proxy list. a) Please install and launch the free program Elite Proxy Switcher. b) Then click its menu File > Download list. The API is just a link (URL). You can open that API link in the browser or your own script/program to get our proxy list. Our normal proxy list is updated every hour. We add new working proxies into the list and remove the dead proxies from the list every hour. The working proxies are remained in the list. * The data of Proxy List #1 is exact. The data of other proxy lists is estimated. * The table is updated every hour. It was last updated at 19 Apr 12:20 GMT. The Premium Proxy list doesn't have the fixed number of proxies. Instead, it is updated every 5 minutes to ensure 90% proxies in it are working. Moreover you can choose to only download the https proxies (support surfing https sites) from the premium proxy list. We add new working proxies into the list and remove the dead proxies from the list every 5 minutes. The working proxies are remained in the list. * The table is updated every 20 minutes. It was last updated at 19 Apr 12:20 GMT. What's the type of your proxies? Our proxies are public http proxy which we collect from Internet so they are unstable. But they are very cheap considering one private proxy charges about $10 per month. Our proxies are suitable for the users who need a lot of proxies but use each proxy for only several hours. Must I buy the software if I only want to buy proxy? No, you can use our free software to download the proxy list you bought. Can I buy only US proxy or Europe proxy? No, you cannot choose the country. About 30% of our proxies are US proxy and 10% are Europe proxy. Can I get more proxies if I buy two proxy lists? No, you will get the same proxies. Are the proxies exclusive for me if I buy the proxy list? They are not exclusive. We provide the same proxies to other users. How do you update the proxy list? We update the proxy list every hour, adding new working proxies into it and removing dead proxies from it. The working proxies will be remained in the list. Do you provide completely different proxy list every day? No, we remain the working proxies in the list. However most proxies die within several hours. They won't be in the list for long. Please make sure you have read our Proxy List Service Agreement before you purchase the proxy list service. If you have any problem about our proxy list service, here are more FAQs about buying proxy. If you didn't find the answer, please post your problem in our forum or just contact us by email.